Humshakals (transl. Lookalikes) is a 2014 Indian Hindi-language comedy film directed by Sajid Khan and produced by Vashu Bhagnani. The film stars Saif Ali Khan, Riteish Deshmukh, Ram Kapoor, Bipasha Basu, Tamannaah Bhatia and Esha Gupta, and Satish Shah, Nawab Shah, Chunky Pandey and Darshan Jariwala in supporting roles. In the film, Khan, Deshmukh and Kapoor each have triple roles, that sums up to a total of 9 characters. The film is shot extensively in foreign locations, starting September 2013. It is co-produced by Fox Star Studios and Vashu Bhagnani's Pooja Entertainment. It was released on 20 June 2014. The film received highly negative reviews from critics, and is considered to be one of the worst films of all-time. Ashok (Saif Ali Khan) and Kumar (Riteish Deshmukh) are best friends, whereas Shanaya (Tamannaah Bhatia) and Mishti (Bipasha Basu) are their love interests. Ashok's father is a multi millionaire but has been in a coma for the last six years, while his wicked Mamaji (Ram Kapoor) teams up with an evil doctor, Dr. Khan (Nawab Shah) to get rid of Ashok and take over all his property. During a board meeting Singh (Ram Kapoor) mixes a medicine in Ashok and Kumar's drink and they both start behaving like dogs. Shooting of the film commenced on 24 September 2013 in London with Saif Ali Khan, Ram Kapoor and Riteish Deshmukh all of whom have reportedly been cast in triple roles. The team of Humshakals shot in Mauritius for the final part of the film starting on 22 February 2014. Two songs and several sequences were shot at the La Plantation Resort & Spa, Le Méridien, Intercontinental Resort, Bagatelle Mall of Mauritius and the Northern Beaches. Mauritian extras also participated in the shooting. Despite poor critical reception, the film did well at the box office during first few days after release. The film recovered its investment although it was still deemed a box office failure. On the review aggregator website Rotten Tomatoes, the film has an approval rating of 0%, based on five reviews, with an average rating of 2/10. 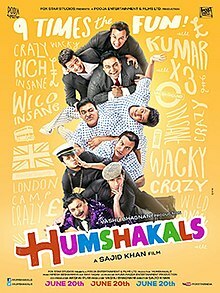 Saurabh Dwivedi of India Today stated "for Sajid Khan, I can only say that Humshakals will be listed in one of the worst films of the century." Mihir Fadnavis wrote in his Firstpost review, "... sexual tomfoolery, shrieking and hamming aside, there's much more to hate about this 'family movie'. It's disturbing to see such an atrocious, regressive, misogynistic, sexist, homophobic cinematic product force-fed to paying audiences. I can understand that a comedy need not be 'safe', but what goes on in Humshakals is simply too horrifying to bear." Sweta Kaushal of Hindustan Times rated the film 0.5 out of 5 and stated "With no story or comedy on offer, even Riteish and Ram are unable to save the day for Sajid Khan." Mohar Basu of Koimoi gave it 0/5 stars and said the film was "[l]oaded with indecipherable dim wit" and "an odd mishmash of pathos and drudgery." Writing in Emirates 24/7, Sneha May Francis claimed that it succeeded Khan's previous endeavor, Himmatwala, in becoming the worst Bollywood film ever. Critic Sonia Chopra of Sify.com wrote "there are bad movies, and then there's Humshakals. The worst film of 2014 so far, in my book". Dainik Bhaskar rated the movie as one of the worst films of the decade. Several of the cast members also lamented their involvement in the film. Bipasha Basu didn't participate in the film's promotions called Humshakals "the worst experience of [her] life," and Esha Gupta warned family members not to see the film. After the release of the film, leading actor Saif Ali Khan lamented that "I've been introspecting a lot and will never repeat a mistake that was Humshakals." The film received five Golden Kela Award nominations, and won for Worst Film. It also won two Ghanta Awards; the film won Worst Picture and Ram Kapoor, Saif Ali Khan and Riteish Deshmukh shared the Worst Actor award. ^ Bollywood Hungama. "Humshakals". bollywoodhungama.com. ^ "Saif Ali Khan plays triple role in Sajid Khan's Hamshakals". Hindustan Times. Archived from the original on 6 October 2014. Retrieved 22 July 2014. ^ "Saif Ali Khan, Riteish Deshmukh to play triple roles in Sajid Khan's Humshakals". The Indian Express. 25 June 2013. Retrieved 22 July 2014. ^ "Aamir Khan vs Saif Ali Khan: 'Peekay', 'Humshakals' to release in June next year". Divya Goyal. Retrieved 30 September 2013. ^ "Tournage de "Humshakals": Bipasha Basu et Saif Ali Khan débarquent à Maurice" (in French). L'express. Retrieved 3 May 2014. ^ "TOURNAGE DE HUMSHAKALS : Saif Ali Khan, Bipasha Basu, Ram Kapoor à Maurice demain" (in French). Le Mauricien. 20 February 2014. Retrieved 3 May 2014. ^ Ankur Pathak (18 July 2014). "Saif Ali Khan: Humshakals was a mistake". The Times of India. Retrieved 20 July 2014. ^ "Humshakals (Original Motion Picture Soundtrack)". iTunes. ^ Geety Sahgal (7 July 2014). "Humshakals box office collections: Despite criticism, Sajid Khan has the last laugh". The Financial Express. Retrieved 20 July 2014. ^ "Box-Office Verdicts of Major Bollywood Releases of 2014". Koimoi. Archived from the original on 24 October 2014. Retrieved 20 October 2014. ^ "Humshakals (2014)". Rotten Tomatoes. Retrieved July 10, 2017. ^ "Movie review: Humshakals is three times trash". India Today. ^ "Humshakals review: How Saif, Riteish teamed up to give your brain damage". Firstpost. 22 June 2014. Retrieved 22 July 2014. ^ "Movie review: Saif Ali Khan is the worst thing about Humshakals". Hindustan Times. Archived from the original on 26 July 2014. Retrieved 22 July 2014. ^ "Humshakals Movie Review | Saif Ali Khan, Riteish Deshmukh, Ram Kapoor". Koimoi.com. 20 June 2014. Retrieved 22 July 2014. ^ "Saif Ali Khan's 'Humshakals' act could make Kareena insecure". Emirates 24/7. 2014-06-29. Retrieved 2014-10-22. ^ "Humshakals review: The worst film of 2014!". Sify.com. ^ "Humshakals, Deshdrohi, Himmatwala: 10 worst films of the decade". Dainik Bhaskar. ^ "Sajid Khan's Humshakals left me disturbed: Bipasha Basu". Mumbai: Hindustan Times. August 8, 2014. Archived from the original on August 9, 2014. ^ "I asked my father not to watch the film, says Esha Gupta". The Times of India. 2 July 2014. ^ "Saif Ali Khan: Humshakals was a mistake". Times of India. Jul 18, 2014. ^ "Humshakals' leads nominations list at Golden Kela Awards". The Hindu. February 17, 2015. Retrieved 2014-10-22. ^ "Sonakshi and Arjun grab top Golden Kela awards". The National. March 15, 2015. Retrieved August 17, 2015. ^ "Ghanta Awards 2015: Sonakshi Sinha, Saif Ali Khan named worst actors". indiatoday. March 10, 2015. Retrieved August 17, 2015. ^ "Ghanta Awards 2015 Complete Winners List: Sonakshi Sinha, Ajay Devgn Win Worst Actor Awards; Farah Khan Worst Director". International Business Times. March 9, 2015. Retrieved August 17, 2015.